HOUSTON (AP) — Barbara Bush didn’t hesitate to tell people that her trademark pearl necklaces were fake. Americans liked that everything else about the snowy-haired first lady was real. Her appearance often provoked jokes that she looked more like the boyish president’s mother than his wife. Late-night comedians quipped that her bright white hair and pale features also imparted an uncanny resemblance to George Washington. 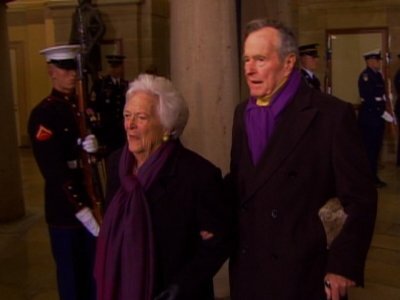 “This is a testament to what wonderful parents they are,” George W. Bush said as Jeb Bush was sworn into office. Jeb won a second term in 2002, and then made an unsuccessful bid for the Republican presidential nomination in 2016.